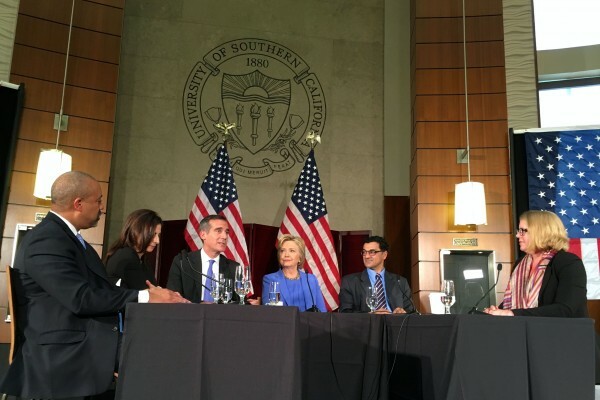 Los Angeles is a model for how to engage communities in the fight against extremism, Secretary Hillary Clinton said at a roundtable on homeland security hosted by Mayor Eric Garcetti at the University of Southern California. The roundtable offered Clinton the opportunity to lift up leaders working to bring together and empower faith communities. CRCC’s Executive Director Brie Loskota joined Salam Al-Marayati of Muslim Public Affairs Council, Joumana Silyan-Saba of the L.A. Human Rights Commission and James Featherstone, formerly of the L.A. City Emergency Management Department, in sharing their experience with the Democratic presidential candidate. Silyan-Saba shared that the work the City of L.A. does to prevent violence cannot happen without good relationships with communities, including faith groups. 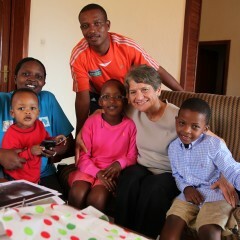 Those communities need resources and increased capacity to take on civic engagement work, she added. Loskota built upon that idea, telling Clinton and Garcetti that it’s the responsibility of government institutions to widen the table to make sure that all can participate in civic life. She and Featherstone both spoke of the ability of faith communities to come together and take leadership following natural and man-made disasters. Loskota also shared the story of how the USC Center Religion and Civic Culture came out to the ashes of Los Angeles’ civil unrest in 1992. CRCC studies the role of congregations and faith-based organizations in their communities and applies its research to help such groups promote civic engagement. While many fear the threat of the ISIS, Loskota noted her fear after attacks on the African Methodist Episcopal church last year in Charleston and the Sikh gurdwara in Milwaukee. Al-Marayati spoke of the need to lift up Muslim voices working to counter extremism in their own communities, referencing MPAC’s Safe Spaces Initiative. Clinton echoed his call, saying she hoped to use her platform as a politician to lift up such voices. After Loskota spoke, Clinton also complimented CRCC’s inclusive approach to civic engagement. “The center is…looking at so many different aspects of how to create more community resilience, responsiveness, integration, inclusion,” she said.